Many of us are interested this weekend in the Supermoon phenomenon. The full moon on Saturday night (tonight) will be especially brilliant and the most spectacular of the year as it occurs when the moon passes closer to Earth than usual. 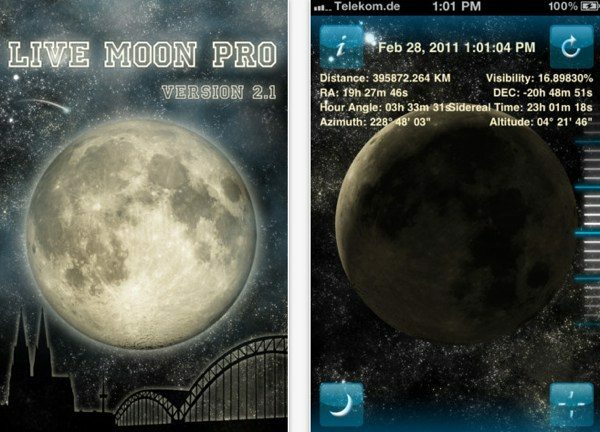 Because we know that many readers will want to follow the Supermoon 2012 we’ve rounded up some of the best Android and iOS apps to enhance watching this special lunar phase. We’ll give you a little background about the Supermoon to start with and the moon’s closes point to Earth is called ‘perigee.’ As tonight’s full moon coincides with perigee that means it will appear brighter than usual, 16% brighter than the usual full moon according to USA Today. The time when the moon will be officially full tonight is 11:35pm ET and it will be closest to Earth some 25 minutes later. Although that means the moon will be 15,300 miles closer to Earth than average, it will still be 221,803 miles away. Onto the apps then and if you want more details or to download these apps simply click on the title links to be taken straight to the iTunes or Google Play stores. The first app we want to tell you about is a highly rated iOS app called Moon Globe. This is a free app compatible with iPhone, iPod touch and iPad running iOS 3.0 or later. With this app users can turn their iOS device into a precision instrument for moon viewing with renders of the moon with realistic lighting and in real time using satellite imagery and topographic laser altimeter data. The view can be manipulated by using the touchscreen of the device and Telescope mode enables you to see the moon exactly as it appears from wherever you are on Earth. Another very good iOS app is Live Moon Pro, also a free app and compatible with iPhone, iPod touch and iPad running iOS 4.0 or later. The app gives you a live look at the moon and tells you what the distance between the moon and the Earth is at that moment. Other features include telling you how much of the moon’s surface is visible, when the next lunar eclipse will take place and even which phase the moon will be in on your birthday. 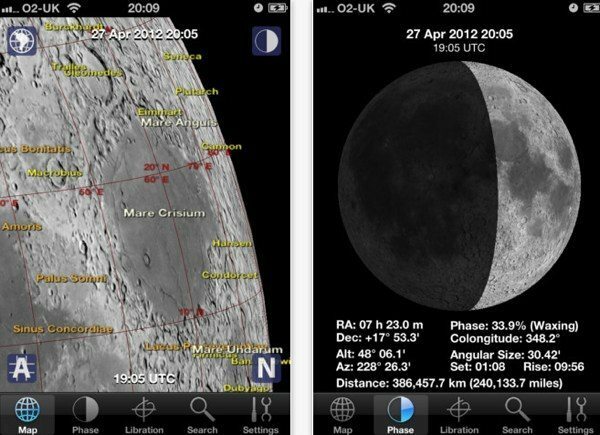 Our last iOS app is the hugely comprehensive Moon Atlas app. This one costs $5.99 but does offer a vast amount of information and is suitable for iPhone, iPod touch and iPad running iOS 3.1.3 or later. This enables you to explore a 3D globe of the moon, manipulating it pinch and finger gestures. Zooming in shows more labels and finer details and double tapping enables you to see more information on a feature. A realtime mode updates to the current time and you can also change the date, location and time. Displays such as the phase and libration of the moon from a chosen location are rendered on the globe and over 1800 named features are included on the app. On to Android apps and first up we have one called Deluxe Moon. This app is priced at $5.77 and for devices using Android 1.6 or later. It’s very highly rated and includes info about the moon from your location, precise times of moon phases, brightness, altitude, a moon phase calendar, a moonrise/moonset/sunrise/sunset table, an apogee/perigee table, moon compass and much, much more. 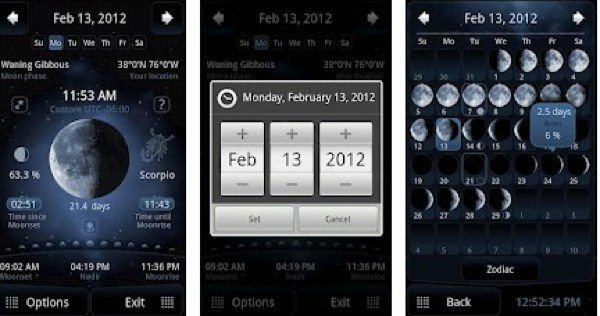 It uses automatic positioning from GPS or cellular network, five different types and sizes of moon phase widgets, has an equinox/solstice table and really everything that you can imagine needing. The next is also an Android app called Sun and Moon and this time it’s a free app for devices running Android 1.6 or later. It makes use of your phone as a telescope and you can also watch solar activity and use the widget to watch current images from NASA satellites and moon phases. Our final suggestion is an Android app called Moon Watch, another free app, this time for Android devices running 1.0 or later. 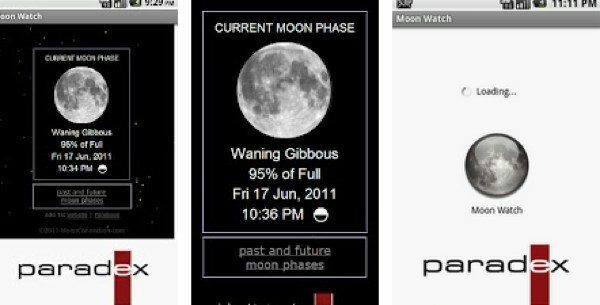 It enables you to follow the moon phases, show the current moon phase, predict, research and track the moon. It would be useful for many enthusiasts and professionals who need to know the current moon position. Hopefully amongst these app suggestions you’ll find exactly the app that you can use to enhance your experience of tonight’s Supermoon. Will you be observing tonight’s Supermoon with interest? Let us know your experiences by sending your comments. WhenÂ will the next perigee moon occur?? My colleague and I are doing a few experiments on the “Super Moon”. This information is extremely vital, and must be answered immediately. Â Â Â Â Â Â Â Â Â Â Â Â Â Â Â Â Â Â Â -Professor M.